They say that size isn't everything. Do you believe that? We don't. We've all seen that run of the mill vampire costumes, none of which would leave the unforgettable impression that this terrifying beast leaves. As horrifying as it would be to run into this creature on the street, a vampire at eight foot tall might actually find it difficult to function as vampires typically do! For one, imagine how tricky it would be to find a big enough coffin to sleep in at night. Even if you were able to get one custom made it would be almost impossible to transport by carriage as vamps like to do in Transylvania! Also, even with all of the glamouring powers in the world, it would be difficult to convince any potential victims to invite this fellow into their home. Maybe it's his red eyes that give him away but he just doesn't seem like a friendly fellow! Also, we'd like to see this guy try to avoid the sun's rays if he accidentally stays out till' day break, no dodging into alley way shadows for this lanky guy. Lucky for you, your career as an oversized vampire will only last as long as you want it to. As scaring goes, this costume ensures success! The giant blue clawed gloves are key to inspiring some creeped-out shrieks. A tall collar will frame your ghastly mask with its batty ears, eerie nose, and sharp toothed grin. 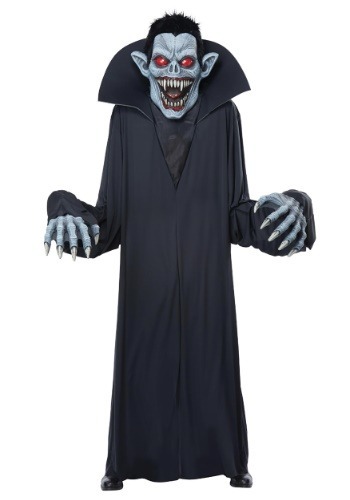 Move over regular-sized vamps this guy is larger than life and ready for a Halloween hoopla! Whether you're spooking in a parade or rocking your neighborhood bash this towering terror is sure a hit. Luckily you can wear this year after a year, one upping this ensemble would be a real tall order!